Everyone needs a place to put things -- Even your FUR BABIES! 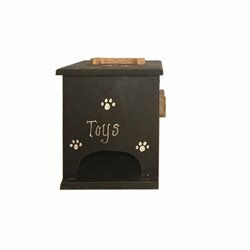 This toy box is the perfect addition to any home with canines that have lots of toys! This toy box features Wooden Bone Handles on the sides and the top for added flair! It also features an acces hole in the bottom of the box for puppy access!! Available in Unfinished, 6 Paint colors, or 2 Stain colors! ***IF YOU ORDER THE TOY BOX UNFINISHED, IT WILL STILL ARRIVE WITH THE PAINTED "TOYS" WORD AND THE PUPPY PRINTS UNLESS OTHERWISE NOTED AT CHECKOUT!! *Amish made in the USA. *Allow 7 days for construction. Please see shipping information for additional details and policies.